Payment Instructions: PAYMENT: Payment is expected immediately following the Auction, on the day of the Auction. Your credit card on file with Proxibid will be charged following the auction. Acceptable forms of payment will be: Visa, MasterCard, Discover, American Express or wire transfer. ALL items invoiced to a bidder must be paid for prior to the bidder removing ANY of the items. If any payment is past due five (5) days following the auction, there will be a 5% late fee assessed to your invoice. If full payment not received by 5PM ET on the seventh (7th) day following the Auction, the nonpaying bidder will have their bidding privileges revoked from Bidilla, Inc and a dispute will be filed against them on Proxibid. ONCE A DISPUTE IS FILED, THE AUCTION IS CLOSED AND IT IS TOO LATE TO MAKE A PAYMENT. Shipping Instructions: See Special Terms of Sale for more information. Preview Date & Times: Preview day is February 11, 2019 with a time prearranged with Bidilla, Inc, in advance. Preview appointments must be made prior to February 8, 2019 at 3PM CT. Appointments can be made by calling 770-322-4507 or by email at info@bidilla.com. Checkout Date & Times: All items are to be picked up by the buyer on February 19th, 2019 from 9 AM CT to 1 PM CT, after full payment of the invoice and verification of funds. See Terms & Conditions for more details. BIDDER TERMS & CONDITIONS: Bidilla, Inc FL AB3574 Principal Auctioneer: Jeffrey Butirro, FL AU4361, FL AB3574, GA AU4107 BIDDING: Bidding on any item will be considered sufficient evidence that a bidder accepts all conditions set forth in these BIDDER TERMS & CONDITIONS. The Auctioneer has the authority to accept or reject any and all bids. The Auctioneer's decisions are final. BUYER'S PREMIUM: A Buyer's Premium of 15% will be charged on the total bid. EXAMPLE: If you intend to spend no more than $100.00 on an item, bid to $86.00. A 15% Buyer's Premium of $12.90 will then be added to the $86.00, bringing your total to $98.90. You will save $1.10. SALES TAX: Florida Sales Tax or Georgia Sales Tax (State and Local) will be collected on all sales made within the state of Florida or the state of Georgia, depending on the auction location. The States of Florida and Georgia Departments of Revenue Rules require that Sales Tax be charged on the total invoice price Including Buyer's Premium. Buyers purchasing items for Resale must provide a current Resale Certificate PRIOR to each Auction. Tax Exempt Bidders must provide a current Tax Exempt Certificate PRIOR to each Auction. MERCHANDISE: ALL ITEMS ARE SOLD "AS-IS, WHERE-IS" WITH NO WARRANTY EXPRESS OR IMPLIED, unless otherwise stipulated. We do our best in describing items. Time will be made available prior to each Auction for a preview of the items to be sold. It is the buyer's responsibility to carefully inspect the items prior to the Auction. Descriptions of an item are not meant to be used in lieu of actually inspecting the item yourself. Most items offered for sale are used and may contain defects not immediately detectable. Bidders are encouraged to inspect the property prior to bidding. Bidders must adhere to the preview and inspection dates and times posted. ALL SALES ARE FINAL. BIDDERS accept any and all liability and will hold Bidilla, Inc and the Okaloosa County Board of County Commissioners harmless for injuries sustained by BUYER or Agents, Employees, or Contractors, or any person acting on behalf of or in conjunction with the BUYER, during the preview and inspection and pickup of items being sold. DESCRIPTIONS AND PHOTOGRAPHS: Occasionally errors occur in item descriptions and photographs. Item descriptions or photographs are not to be used in lieu of a personal inspection of an item. Time is made available prior to the auction to inspect the items. ALL SALES ARE FINAL! PAYMENT: Payment is expected immediately following the Auction, on the day of the Auction. Your credit card on file with Proxibid will be charged following the auction. Acceptable forms of payment will be: Visa, MasterCard, Discover, American Express or wire transfer. ALL items invoiced to a bidder must be paid for prior to the bidder removing ANY of the items. If any payment is past due five (5) days following the auction, there will be a 5% late fee assessed to your invoice. If full payment not received by 5PM ET on the seventh (7th) day following the Auction, the nonpaying bidder will have their bidding privileges revoked from Bidilla, Inc and a dispute will be filed against them on Proxibid. ONCE A DISPUTE IS FILED, THE AUCTION IS CLOSED AND IT IS TOO LATE TO MAKE A PAYMENT. REGISTRATION: Registration is required in order to bid at any Bidilla, Inc Auction. This registration includes your name, address, phone number, email address, state issued Identification or Driver's License, and credit card number. Since the act of bidding at an Auction creates a binding contract, the giving of false registration information may constitute an act of fraud. By registering to bid you agree to be added to our email list. You have the option to opt-out after you receive the first email. PREVIEW: All items are available for preview prior to the auction. Preview day is February 11, 2019 with a time prearranged with Bidilla, Inc, in advance. Preview appointments must be made prior to February 8, 2019 at 3PM CT. Preview appointments can be made by calling 770-322-4507 or by email at info@bidilla.com. Location: 250 Roberts Blvd., Ft Walton Beach, FL 32547 ITEM PICKUP: All items are to be picked up by the buyer on February 19th, 2019 from 9 AM CT to 1 PM CT, after full payment of the invoice and verification of funds. No party, other than Bidilla, Inc is authorized to release any item sold at this auction. ALL ITEMS MUST BE PICKED UP BY FEBRUARY 19, 2019 AT 1 PM CT. THERE ARE NO EXCEPTIONS TO THIS. ANY ITEM REMAINING AFTER FEBRUARY 19, 2019 WILL BE CONSIDERED ABANDONED PROPERTY. NO REFUNDS WILL BE GIVEN ON ABANDONED PROPERTY. SPECIAL NOTES ON PICKUPS: Please bring loading assistance with you. There will be no loading assistance from Okaloosa County Employees or Bidilla, Inc. All loading is at ground level. THERE IS NO DOCK LEVEL DOOR! Some items may require disassembly or equipment to move from location. Please bring adequate tools and equipment with you. There will be no tools or equipment (ie: forklift, pallet jack, handtrucks, flatbed dollies, ladders, etc) available at the location. There will be no assistance from Okaloosa County Employees or Bidilla, Inc on disassembly. There is the possibility that your items may be blocked by other winning bidders' items. We ask that you use the same care and respect for their items as you would with yours. REMOVAL OF LOTS FROM A SALE: Bidilla, Inc will make all reasonable efforts to have all items advertised, available for sale. However, there may come an occasion that an item must be removed from the sale. Bidilla, Inc, assumes no liability for damages incurred by the removal of an item from a sale. RESERVE: Most items are offered without reserve or minimum bid. If an item has a reserve, a proxy bidder may bid on behalf of the seller until the reserve is met. However, we will not offer an opening bid on behalf of the seller. If no opening bid is received, or if the bidding does not reach the reserve amount, we will pass the item or submit the high bid as an "offer" to the seller for their acceptance. LIABILITY: By Bidding, the Bidder agrees to hold Bidilla, Inc and the Auctioneer harmless for errors & omissions. Further, the Bidder agrees to hold Bidilla, Inc and the Auctioneer harmless, as agents of the seller, for issues arising from the transfer of title of goods purchased. SELLERS: Sellers are NOT permitted to bid on their own items, nor are they permitted to have an employee or agent bid on their behalf, if the item is to be sold "Absolute" or without a reserve. EMPLOYEES & ASSOCIATES: Employees and associates of Bidilla, Inc are permitted to purchase lots at competitive bidding under the same terms, rules and regulations as the general public. ARBITRATION: In the event that a dispute arises from an Auction under these TERMS & CONDITIONS, the Bidder agrees to resolve the dispute through Binding Arbitration, whereby the prevailing party is entitled to reimbursement of their legal fees by the opposing party. VENUE: By bidding at this auction, the bidder agrees that the contract created by these conditions of sale is made and performed in the county where the Auction is conducted, in the State of Florida. Any dispute arising from this Auction will be resolved in, and under the laws of the County and State where the Auction was conducted. SEVERABILITY: The Bidder agrees that if any portion of these TERMS & CONDITIONS is deemed unenforceable or invalid, the remainder of the TERMS & CONDITIONS shall remain enforceable and valid. SHIPPING: The BUYER is responsible for all removal packing or packaging and shipping of all purchased items. BUYER accepts any and all liability and will hold Bidilla, Inc and Okaloosa County Board of County Commissioners harmless for damages to the purchased items and/or damages to the property of others incurred by the removal, packing or packaging and shipping process. BUYER accepts any and all liability and will hold Bidilla, Inc and Okaloosa County Board of County Commissioners harmless for injuries sustained by BUYER or Agents, Employees, or Contractors, or any person acting on behalf of or in conjunction with the BUYER, during the removal, packing or packaging and shipping process. The UPS Store #6577, 2260 Ferdon BLVD, Crestview, FL 32536, (850) 689-2006 or store6577@theupsstore.com A+ Pak-N-Ship, 1328 N Ferdon Blvd., Crestview, FL 32536, (850) 398-8636 or blueprints@gccoxmail.com Eagle Packing & Crating Services Inc, 1075 S Fairfield Dr., Pensacola, FL 32506 (850) 456-0504 (850) 681-4556 boxnbubble@yahoo.com This company can handle picking up, packing, and shipping anything from small items to large items that must be palletized and put on a truck. They are also willing to give shipping quotes before you bid. This is just one resource available to you, and is not a recommendation to use any particular company. PLEASE READ - TERMS & CONDITIONS OF AUCTION - PLEASE DO NOT BID ON THIS LOT - IT IS THE BIDDERS RESPONSABILTY TO READ AND UNDERSTAND THE TERMS & CONDITIONS OF THIS AUCTIO...moreN. (FULL TERMS & CONDITIONS CAN ALSO BE FOUND BY CLICKING THE "TERMS OF SALE" TAB ABOVE. THE PHOTOGRAPHS IN THIS LOT ARE OF THE TERMS AND CONDITIONS. HIGHLIGHTED SECTIONS CONTAIN KEY INFORMATION REGARDING PREVIEWS, PAYMENT, & PICKUPS. PLEASE DO NOT BID ON THIS LOT. IF YOU BID ON THIS LOT, YOU WILL BE CHARGED THE AMOUT OF YOUR BID, BUYERS PREMIUM, & SALES TAX. AFTER PAYMENT YOU WILL BE EMAILED YOUR OWN PERSAONAL DIGITAL COPY OF THESE TERMS & CONDITIONS. FALIURE TO PAY FOR THIS OR ANY OTHER LOT WILL RESULT IN A DISPUTE FILED AGAINST YOU WITH PROXIBID. 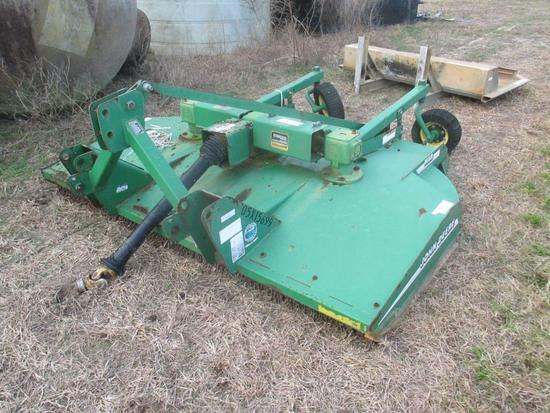 John Deere MX8 Bush Hog Blade is 8 Feet, Measures Approx. 101"L x 101"W x 38"H. Has Scratches and Abrasions. Condition Unknown and Untested. By Bidding on this Item you a...morere agreeing to, and accepting the terms & conditions of this auction. These can be found under the special terms of sale, by clicking the "Terms of Sale" above. You've been outbid to 2****p! to YOU! Road Gear Truck Head ache Bar Measures Approx. 72"L x 72"W x 20"H. Has Scratches and Abrasions. Condition Unknown and Untested. By Bidding on this Item you are agreeing t...moreo, and accepting the terms & conditions of this auction. These can be found under the special terms of sale, by clicking the "Terms of Sale" above. You've been outbid to d****k! to YOU! Metal Liquid Storage Tank Has Hoses, and Van Guard Motor, 16 HP, Measures Approx. 196"L x 90"W x 61"H. Has Scratches and Abrasions. Condition Unknown and Untested. By Bid...moreding on this Item you are agreeing to, and accepting the terms & conditions of this auction. These can be found under the special terms of sale, by clicking the "Terms of Sale" above. Plastic Liquid Storage Tank 10 Feet High. Unknown Gallons. Has Scratches and Abrasions. Condition Unknown and Untested. By Bidding on this Item you are agreeing to, and a...moreccepting the terms & conditions of this auction. These can be found under the special terms of sale, by clicking the "Terms of Sale" above. Double Wall XERXES Liquid Storage Tank Measures Approx. 247"L x 96" Diameter. Unknown Gallons. Has Scratches and Abrasions. Condition Unknown and Untested. By Bidding on ...morethis Item you are agreeing to, and accepting the terms & conditions of this auction. These can be found under the special terms of sale, by clicking the "Terms of Sale" above. Double Wall XERXES Liquid Storage Tank Measures Approx. 247"L x 96" Diameter x 136"H. Unknown Gallons. Has Scratches and Abrasions. Condition Unknown and Untested. By Bid...moreding on this Item you are agreeing to, and accepting the terms & conditions of this auction. These can be found under the special terms of sale, by clicking the "Terms of Sale" above.